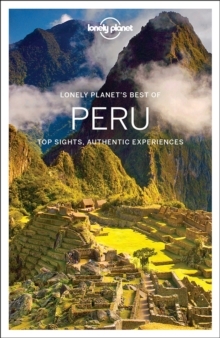 Lonely Planet: The world's leading travel guide publisher Lonely Planet Best of Peru is your passport to Peru's top sights and most authentic experiences. Scale the heights of Machu Picchu; puzzle over the Nazca Lines; or visit the sweltering, seductive Amazon Basin, all with your trusted travel companion. Offering visually-inspiring content along with the most relevant, up-to-date advice on what to see and skip, and what hidden discoveries await you, this photo-rich, user-friendly guide makes planning fun and easy. Discover the best of Peru and begin your journey now! Inside Lonely Planet Best of Peru: In-depth coverage of the destination's must-see sights along with hidden gems that most guidebooks miss to get you to the heart of a place Intuitively organized with essential information at your fingertips Eye-catching full-colour design and easy-to-use layout with maps and images throughout Annotated images that bring a destination to life Practical planning and transport tools including a fold-out map (included in print version) that gives instant access to must-see sights to help you navigate as you plot out your itinerary Short and extended itineraries to help you tailor your trip to your personal needs and interests to make the most of your time on the road Insider tips and insights to save time and money, avoid crowds and trouble spots, and to get to know the destination like a local Honest recommendations for all budgets Cultural insights and background information to put top sights and experiences in context and to give you a richer, more rewarding travel experience (includes history, outdoor activities, environment, wildlife, cuisine, music, arts, and language) Covers Lima, Islas Ballestas, Nazca, Arequipa, El Valle Sagrado, the Cordilleras, Lake Titicaca, Cuzco, Machu Picchu, Huaraz, Trujillo, Iqutos, Amazon Basin and more The Perfect Choice: Lonely Planet Best of Peru , our easy-to-use, expertly curated guide, is filled with inspiring and colourful photos and focuses on Peru's most popular attractions and authentic experiences for those looking for the best of the best and have minimal time for planning. Looking for a comprehensive guide that recommends both popular and offbeat experiences and extensively covers all of the ins and outs of the country? Check out Lonely Planet Peru. Looking for more extensive coverage? Check out Lonely Planet South America on a Shoestring guide for a comprehensive look at all the region has to offer. TripAdvisor Travelers' Choice Awards 2012, 2013, 2014, 2015, and 2016 winner in Favorite Travel Guide category 'Lonely Planet.